The Cougars return a talented core of players from 2017 and want to challenge for a conference and state title. Sarah Pintel of Cherry Hill High School East sets up a play during a scrimmage on Aug. 23 against Princeton High School. 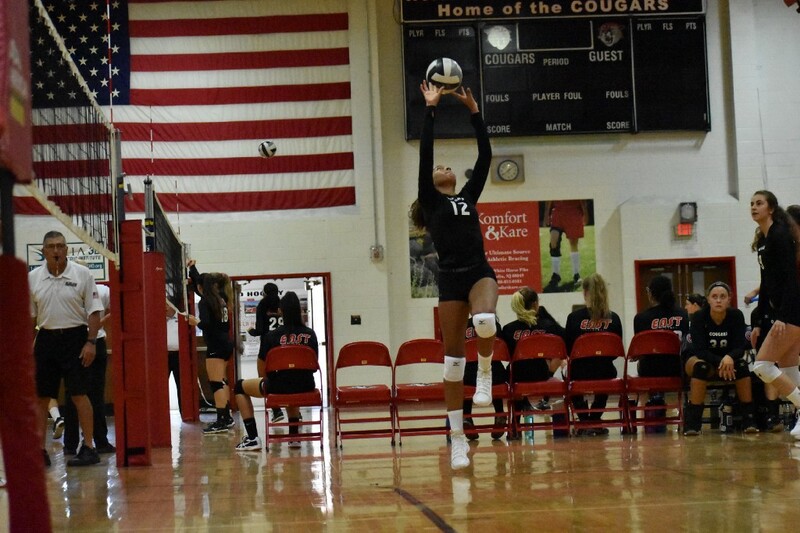 Cherry Hill High School East girls volleyball began building expectations for the 2018 season back in 2017. Last year, the Cougars had an almost entirely new starting lineup and had an up-and-down season, finishing 14–10. However, Cherry Hill East played better as the season went on, winning four straight games to finish the regular season before losing in the first round of the NJSIAA Group IV playoffs. Senior outside hitter Sharon Um said the team was pumped even after its playoff loss. “Even after we lost the playoff game last year, on the bus we were super sad, but we were already like, we’re seniors. Let’s get this started,” Um said. This year, the Cougars return most of their 2017 starting lineup and feature an experienced team with five seniors. Those five seniors, Um, Sarah Pintel, Lori Pacuku, Rachael Boyle and Emily Lass, have a tight bond and are hoping the team’s talent, combined with its chemistry, makes for a winning recipe in 2018. Pintel said head coach Scott Mooney spelled out his expectations for the team when the preseason started. Mooney and his players believe Cherry Hill East could have one of the state’s top teams this year. The Cougars’ lineup is not just senior-heavy, but balanced. Pintel has been a critical part of the team since she joined the program in 2015 and entered the season with a little less than 500 career kills. 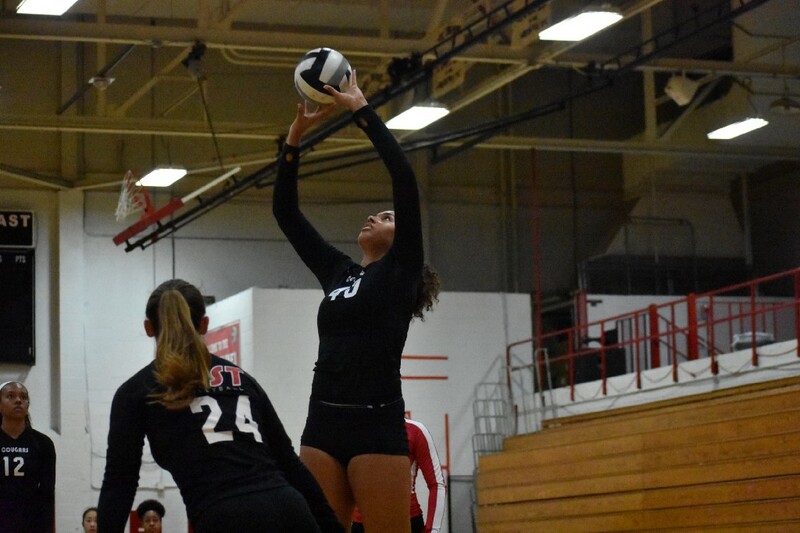 Um is a key part of Cherry Hill East’s defense and is expected to receive a lot of serves this season. Pacuku is a middle hitter whom Mooney identified has an intelligent player who adds stability up the middle. Monah Pintel tries to set up a spike for Cherry Hill High School East during a scrimmage on Aug. 23 against Princeton High School. With so much experience in the lineup, Cherry Hill East has cranked up things up this preseason, adding more plays to its arsenal and changing up the offense. Um noted the team’s talent level helped get the team in game shape before the Cougars ever took the court for a scrimmage. “We are very competitive against each other in practice,” she said. Cherry Hill East had a packed scrimmage schedule against a variety of opponents. On Aug. 23, the Cougars hosted both Princeton High School and Paul VI High School, playing each team for about one hour. Lass said playing different opponents back-to-back has its benefits. Cherry Hill East recognizes even with its deep and experienced team, winning a state title will not be easy. It’s been five years since any South Jersey program has won a girls volleyball state championship in any group. Cherry Hill East won its only state championship in program history in 2005. The Cougars recognize the task ahead and are embracing the challenge.